It's always funny to me that it's extremely easy to find a picture of almost any veteran quarterback combination looking like they're about to try to make out through their face masks. In past seasons, Philadelphia Eagles fans generally rooted for their own team, and kept an eye on the rest of the NFC East. In 2018, with the Birds being among the favorites to represent the NFC in the Super Bowl, it's perhaps worth keeping tabs on the conference, as opposed to just the division. You know, assuming they get out of this early-season funk. And so, each week we'll lay out a rooting guide for non-Eagles games on the NFL schedule, and yes, I'm aware that most of the below is obvious. • Ravens at Browns: As always, a reminder that the Eagles own the Ravens' second-round pick next year, so the more games they lose, the better. That's not going so well, by the way, as the Ravens are 3-1 and own the best point differential (+58) in the AFC. • Packers at Lions: Obviously, a Lions win is better here. I don't need to explain that, right? • Falcons at Steelers: The Falcons are among the biggest disappointments in the NFL so far this season, as they sit at 1-3. 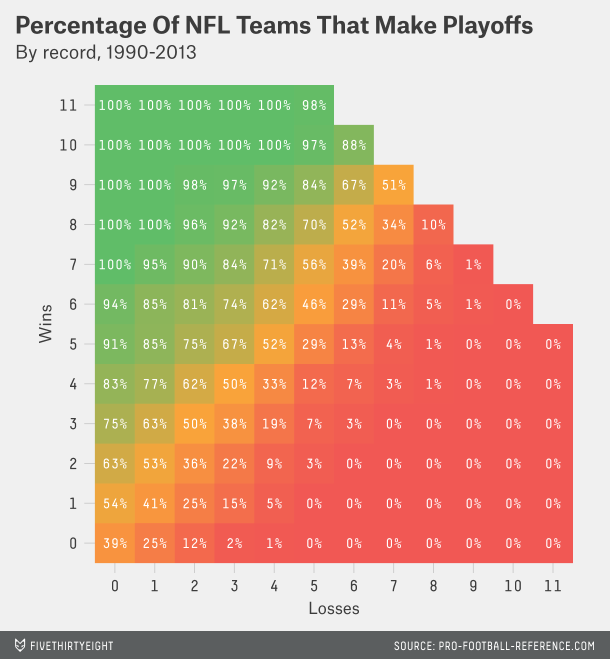 According to the following chart (which is a few years old now, but should still be pretty representative of the correct odds), teams that start 1-4 have a five percent chance of making the playoffs. Meanwhile, the Steelers aren't much better off at 1-2-1, and as you may or may not have heard, the Eagles are rumored to be interested in Le'Veon Bell. I'm trying to decide if a Steelers' tailspin would help the odds of that trade actually happening. Bell would unquestionably help the Steelers if he returned to them, but if there isn't much to play for by, say, Week 8, maybe that helps close the gap in any hypothetical trade compensation negotiations? Sooooooo... Yes? So if you want the Eagles to deal for Bell, maybe you want the Steelers to lose. 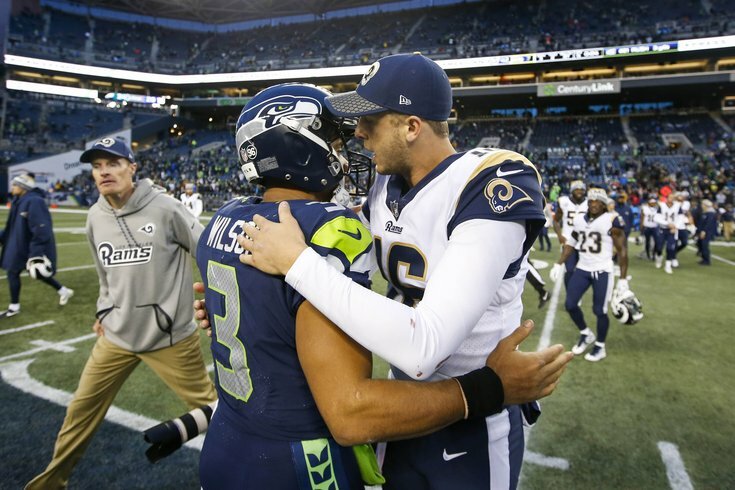 • Rams at Seahawks: The Rams look really, really good, and any loss by them would help quell the idea that they're going to be a juggernaut this season. • Cowboys at Texans: Throughout the season so far, I've been bullish on rooting for the Cowboys to win games against bad teams so that Jerry Jones talks himself into his puppet head coach for one more season, and his ability-limited quarterback for the long-term. At the same time, it's hard not to root for shots of angry Jerry in the booth after a loss on national television. So you just decide what's best for you on that one. • WASTEAM at Saints: If Washington wins this game, they will have consecutive wins over the Packers and Saints, which is nothing to sneeze at. Maybe we'd have to reconsider that the entire rest of the NFC East just isn't very good? It's probably best if they lose this game, as they are expected to do.